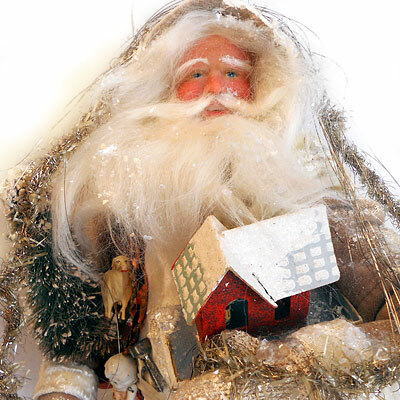 Carrying all antique toys and dressed in faded vintage velvet, this one of a kind Victorian Father Christmas is ready to brave the snowy night. His sack is an old crazy quilt and his toys include: a bisque doll, a cardboard Putz house, celluloid sheep, bottle brush tree and horn. I make each face from a lump of clay and insert teeth and hand blown German glass eyes, giving him a kind expression.